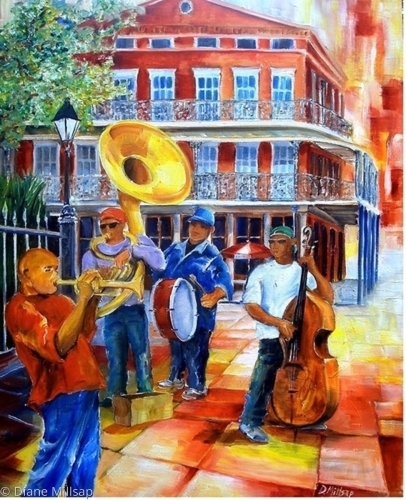 Sample of a Commissioned Painting: New Orleans musicians, the epitome of Cool, jam in the French Quarter. Large pallet knife oil painting. 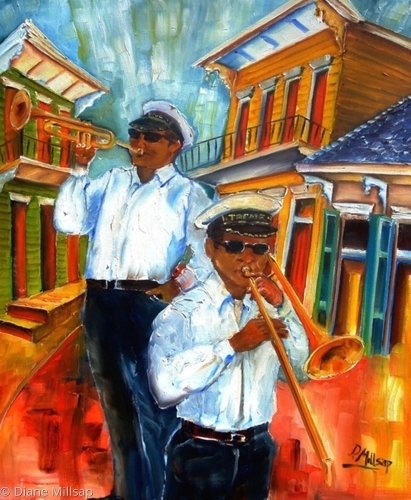 A beautiful day in the French Quarter is filled with the jazz beat of New Orleans finest musicians. This representational abstract painting glows with brilliant reds and sparkling cream and gold tones. Painted on a 1 1/2" deep gallery wrapped canvas, this work may be hung unframe if desired. (The edges of the canvas are also painted, and a picture wire kit is included. Certificate of authenthicity is enclosed. To purchase, please use PayPal. Ships within 24 hours via US Priority Mail. $23.00 fee includes insurance. 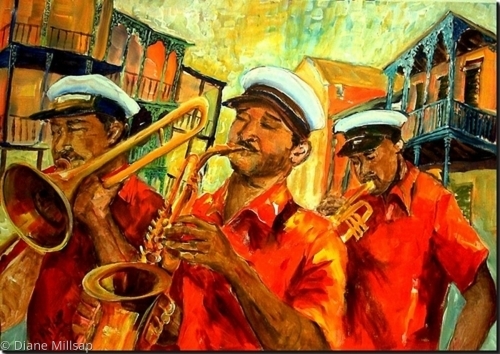 The wail of a trumpet and the beat of a New Orleans brass band fill the air on Jackson Square in this vibrant original oil painting. 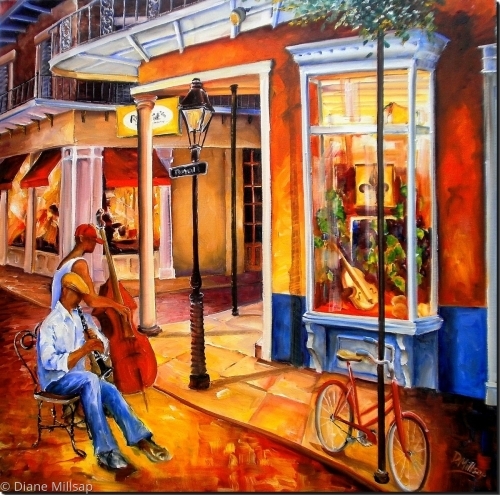 A popular corner in the French Quarter, Royal & St.Peter, is where you can catch local jazz musicians playing night or day. 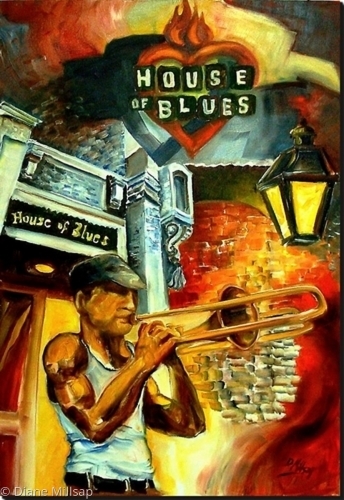 There is nothing like music up close and personal in New Orleans! 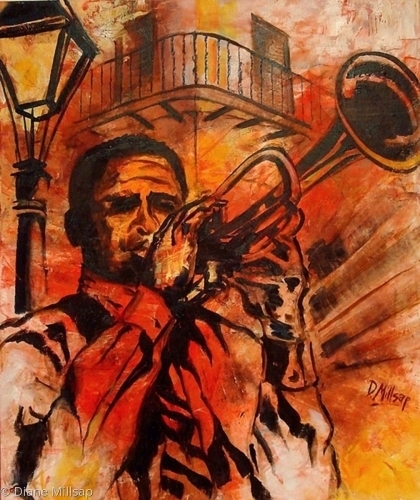 A musician plays his trumpet with soul on the streets in New Orleans, the birthplace of jazz. 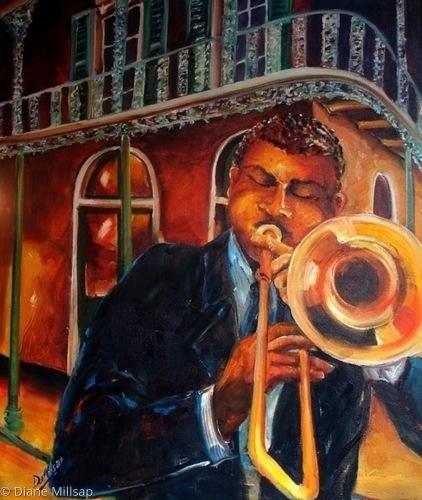 This painting was donated to the Threadhead's 2011 Jazz Fest Charity raffle. 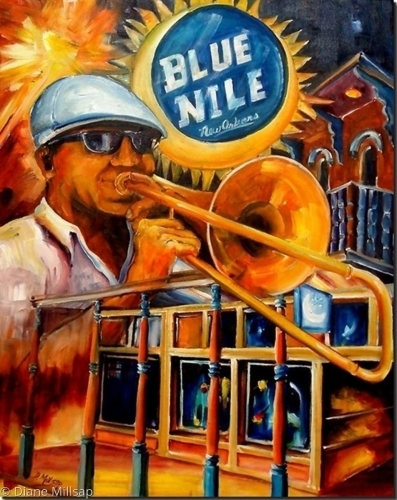 New Orleans' lively neighborhood of Treme is captured in glowing color in this vibrant original oil. 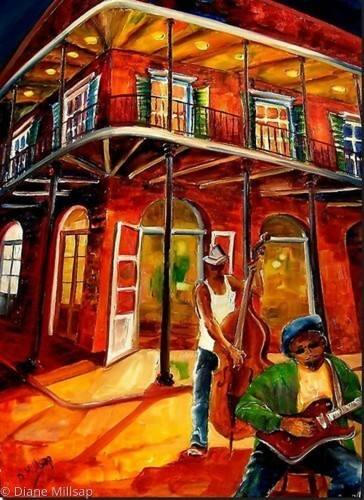 It is painted +with broad brush strokes and dynamic perspective. This piece may be hung unframed if desired. The 1 and 1/2" deep sides of the gallery wrapped canvas are painted black. Original oil on Callery Wrapped Canvas, 36" x 36". 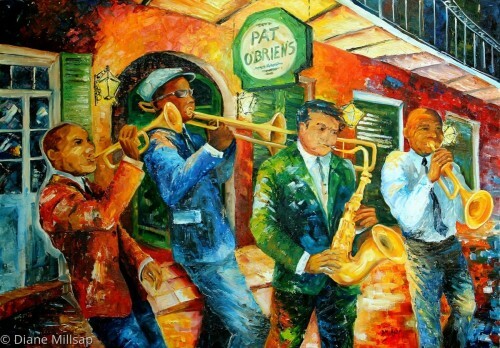 New Orleans' Royal Street is "safe haven" for local musicians. The gates are up, no cars, and jazz fills the streets! Oil on gallery wrapped canvas. 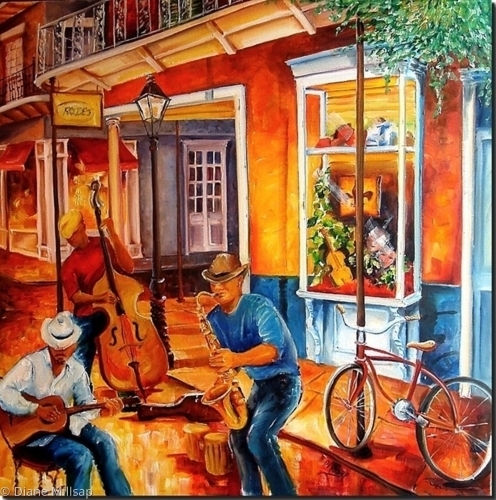 This large original oil, painted in a modern impressionistic style, captures the mood and flavor of New Orleans. 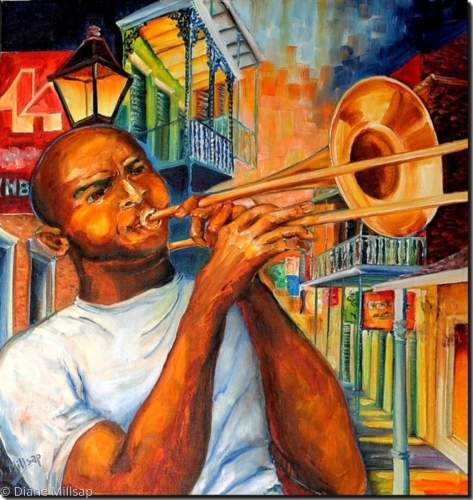 For Sale- This original oil pays tribute to the musicians of New Orleans. 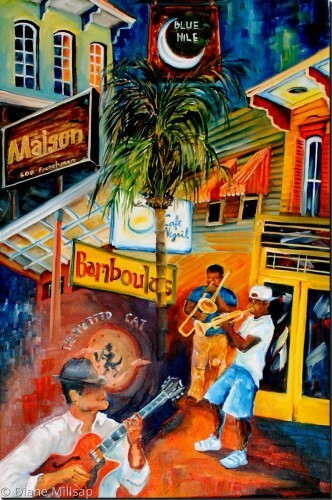 SOLD: Frenchmen Street, where music is live, local, and authentic New Orleans! This original oil is painted on a gallery wrapped canvas, and is ready to hang. Please contact me for purchasing information. 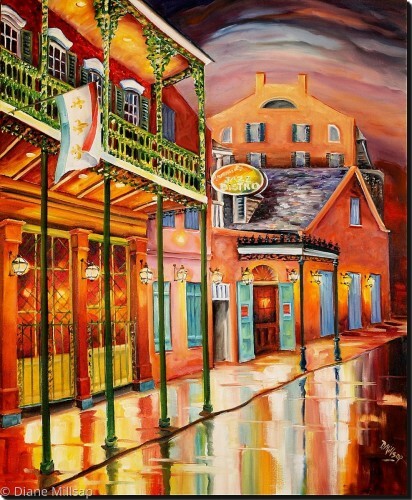 SOLD: Just off Bourbon Street is the entrance to Arnaud's Bistro, where the New Orleans jazz COOL! Painted on gallery wrapped canvas, ready to hang. Please contact me, or go to the New Originals tab for purchasing information.